1. It's a 43 year old whisky, damn it! I'll likely never drink anything older. 2. The price was right. 3. And if those weren't good enough reasons, here's a better one. THIS time I was not drunk when I took the notes. North of Scotland was first named Strathmore Distillery when it was built in 1957 by George Christie (the owner of Speyside Distillery). It changed its name to North of Scotland in 1964, which is ironic since it's at the very southern tip of the Highlands. It was originally intended for single malt production via Coffey stills, but switched to the cheaper grain whisky in 1960. At that time it was the smallest grain whisky distillery in the land with a capacity around 3 million liters. It was closed in 1980, sold to DCL (neo-Diageo) in 1982, and then dismantled in 1993. And, apparently, it used to be haunted by a former brewer. 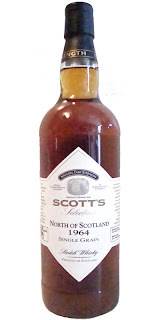 As per Scott's Selection's website, Robert Scott had been employed by George Christie and the Speyside Distillery as a Master Distiller for a number of years. After his retirement, Scott formed this independent bottling company (which seems to be based in The Netherlands). Happily, he was able to use his connections to grab some casks of unusual stuff, including at least three casks of North of Scotland grain whisky. The bartender poured me the last of the bottle on June 13th; a very generous pour I must say. I got a good look at the bottle this time. Scribbled in black marker on the back of the bottle was: $20.00. Did someone get it at an auction for $20? Or was the bar supposed to be selling it for $20? No one knew. Thus I enjoyed my 2 to 3 ounce pour of Lyndon Baines Johnson-era whisky for less than a dram of Black Label. Mark that up as a good evening. You may notice my notes here are different the previous report on the same whisky. That's because, as mentioned above, my senses were not compromised. It's not as bourbony as I'd previously thought. It was quite sweet though, but an old tired sweet, as if the whisky was like, "It's been forty-eight years, someone just finish me off already." The corn sweetness leads me to think that maize was the main grain in the mash. That particular flavor isn't my cup of tea, though it does often show up in American hooch. Despite all of that, it was my honored pleasure to put this whisky to sleep. Always cool when you can find a bar that has some amazing bottle of hooch that they don't know what it's worth. Definitely! Those opportunities are few and far between. That's why I went back for seconds. Hi DA. We'll see if any passing readers know about its auction value because I don't follow the secondary market. But there are a whole bunch of auction sites (mostly in UK and continental Europe) which are usually searchable/Google-able. Keep in mind that single grains are cheaper than single malts, and that may carry over into auctions as well.